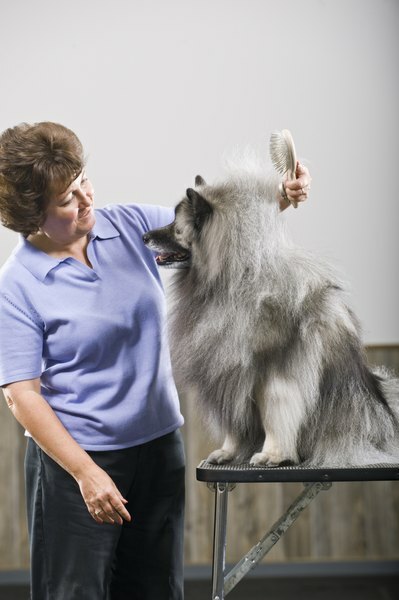 Regular grooming keeps a dog's coat and skin healthy. Unless your dog is a super short hair breed, such as a boxer, you can easily overlook the condition of his skin under all that fur. Regular grooming and a healthy diet go a long way toward helping your dog live comfortably in his skin. Scratching is often the first sign of a problem. Overly dry skin, an allergic reaction or a nasty tick bite can all irritate your poor pooch, sending his hinds legs into action as he tries to alleviate the itch and irritation. Licking accompanies scratching and it doesn’t take long for your dog to scratch or lick a sore. An occasional itch is okay, but if your dog is scratching obsessively, it’s time for a vet visit. Regular baths keep your dog’s coat clean and healthy, but too frequent bathing can lead to dry skin, dandruff and itching. People shampoo can irritate a dog’s skin, with the exception of tearless baby shampoo, which can be diluted at the ratio of one part baby shampoo to two parts warm water for washing his face. For the rest of his coat, choose a mild conditioning dog shampoo. Thorough rinsing is essential. Even a trace of dog shampoo left in his coat can dry out his skin. Brushing your dog does more than remove loose fur before it magically sticks to your sofa. It massages and stimulates his skin and increases circulation. Opt for brushes with rounded bristles to prevent scratches. Longhair breeds needs twice weekly brushing. Gently brush or rub shorthair breeds with a damp washcloth once a week to keep skin healthy. Conditioning skin wipes are available from veterinarians and pet supply stores for cleaning deep skin folds on pugs and other dogs with excess skin. High quality commercial dog foods contain balanced nutrients that may promote healthy skin and coats in most dogs. Your vet might recommend supplementing your dog's diet with fatty acids, however, if he suffers from a skin disorder like seborrhea. Provide plenty of fresh drinking water to keep satisfy his thirst and to keep his skin hydrated and healthy. The Complete Home Veterinary Guide; Chris C. Pinney, D.V.M.